Campomarino Maruggio, Torre Colimena, Porto Cesareo, Nardo, Gallipoli, and more! 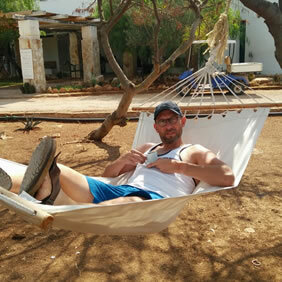 Join Italy Gay Travels on an exclusive Gay Running & Hiking Tour in the southeasternmost tip of Italy, Puglia. 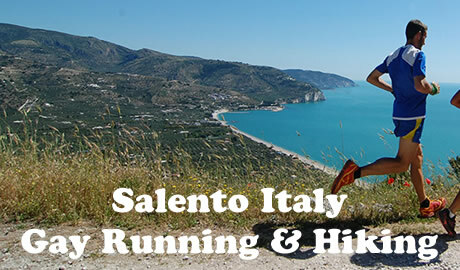 Spend a full week running or hiking along some of the most beautiful landscapes in Italy. 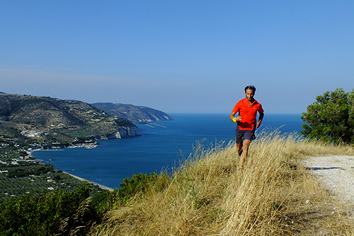 The Gay Running and Hiking tour strides along stunning beaches and hectares of ancient olive groves. You set the pace, choose to either run or hike. Our experienced guides are there to ensure that you have the best experience. Starting from the land of Primitivo wine, we head SouthWest, seaward. We surpass soft sandy dunes, covered by bushveld and finally follow the way of the beach and the sea. The winds may be with us or against us but they will bring fragrances of aniseed and typical Puglian smells that will captivate your heart. Stop to se the lagoons with pink flamingos and ancient crumbling towers typical of a bygone era. Welcome to Puglia, the Southeasternmost tip of Italy. 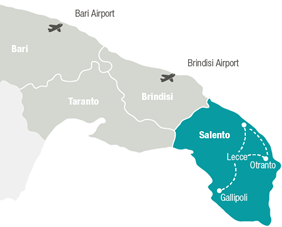 Fly to either Bari or Brindisi airport. Make your way to Campomarino Maruggio, home to the most beautiful gay beach in Puglia: D’ayala. Here we stay in a gay-only bed and breakfast, moments away from the beach. Meet your hosts Kendall and Sergio and get your Gay Running Tour Welcome pack. Spend your afternoon as you like: have a dip in the pool or head to the beach. In the evening, join your fellow Gay Runners and hikers and your tour hosts, Sergio and Kendall, for a Complimentary Welcome Dinner by the pool. This will be your opportunity to get to know each other and have a full briefing on the adventure that lies ahead. After breakfast, feel free to spend the day at your leisure: this is not a compulsory running day, not yet! Relax by the pool, or put your shoes on and make your way on your own to explore the beautiful surroundings of the area. In the afternoon we will make our way to Commenda D’ayala beach: clothes are optional! You will experience one of the most beautiful gay beaches: crystalline waters and golden sand in a Maldivian environment! For dinner, we will head to a local Braceria: you will enjoy fresh cuts of the best local meat, vegetarian options also available! Get fully charged at breakfast as we start the first chapter of this amazing Gay Running and Hiking Tour! 15km by the sea! From Campomarino’s beach we embark into a world of tranquility by the dunes. Set along the backdrop of the beautiful Ionian Sea we head south. We will take a break to have a dip in the beautiful sea. Upon arrival at our accommodation around Torre Colimena, you have the rest of the afternoon to relax by the beach, take a stroll, gran a massage or sleep! We all meet for dinner. Italy Gay Travels takes you to the best seafood in town. Savour the catch of the day and reminisce the days achievements! After breakfast, it’s time for the second stage of this amazing Gay Running and Hiking Tour. We head to Porto Cesareo, 15 km away. We run along Punta Prosciutto with its crystaline waters. After passing through Torre Lapillo we make our way into the lively town of Porto Cesareo, famous for its long sandy beaches. At dinner, you will once again experience local cuisine in the best spots in town. We are sure your muscles need some break! This Gay Running and Hiking Tour is not a Tour de Force. In the afternoon you will have the opportunity to learn to cook like a local from the master chefs of Puglia. Learn the secrets of Puglia’s world renowned food! Cooking in Puglia is a very intimate experience (but you can keep your clothes on)! Recipes have been handed down from generation to generation and truly represent the Mediterranean diet. Naturally we eat what we’ve made. Enjoy the rest of the day to explore the area on your own, doing some shopping or relaxing by the beach. 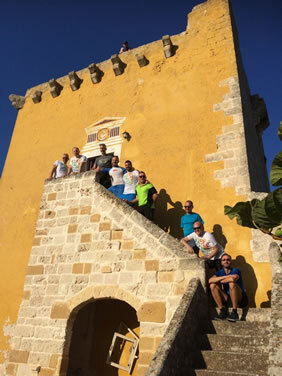 After breakfast we start the 3rd stage of our Gay Running and Hiking Tour: from Porto Cesareo we make our way to the enchanted town of Nardo’. This trail heads inland: through small woods and undulating downhill passes through a parade of hedges and gates that hide antique mansions, the remains of Salento’s aristocracy. The arrival in the Cathedral Square of Nardò is a worthy end to today’s journey. In the afternoon, we will have the opportunity to taste some of the best local wines around. Do Primitivo and Negroamaro ring a bell? We will visit a local winery and learn the secrets of winemaking from the masters of the art. For dinner, Italy Gay Travels will treat you to an authentic local dinner right in the centre of the beautiful Nardo’. 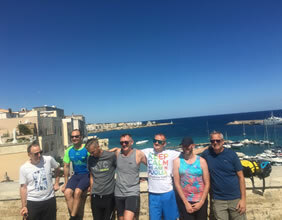 After breakfast, we embark on the final stage of this amazing Gay Running and Hiking Tour: from the enchanted town of Nardo’ we will head to the gay capital of Southern Italy: Gallipoli. It is a smooth 20 km glide through the beautiful seaside towns of Santa Caterina, Santa Maria al Bagno and Lido Conchiglie. We finish in Gallipoli, famous for its beaches, its Old Town and gay summer nightlife. After checking in into the hotel, the afternoon as you wish. Make sure to join us for the Farewell Aperitif by the Beach. We will finish the night in Led Cafe: the gay bar, boasting our achievements and mingling with the local talent. Selection of Bed and Breakfast and 3/4* Hotels. 7 breakfasts and all evening meals included. This tour is accessible to anyone with a basic running/hiking ability. You need to be in relatively good shape. There are around 15 km a day. The running pace is between 4 minutes 30 seconds and 5 minutes 30 seconds a kilometer. The hiking is at walking pace. Upon arrival, you will be greeted and briefed to the activities for the week ahead. You will be provided with an assistance number, you can call us at any time during your stay. Paying a single supplement is not required. We will try to match you with a roommate if you are traveling alone and prefer to share a room. If this is not possible, a single supplement will be applied to your reservation before the final payment date. Balance payment not later than 90 days before the trip. Web Page © Happy Travel, Ltd. Logos and Images © Atlantis Events Inc., Italy Gay Travels, etc.